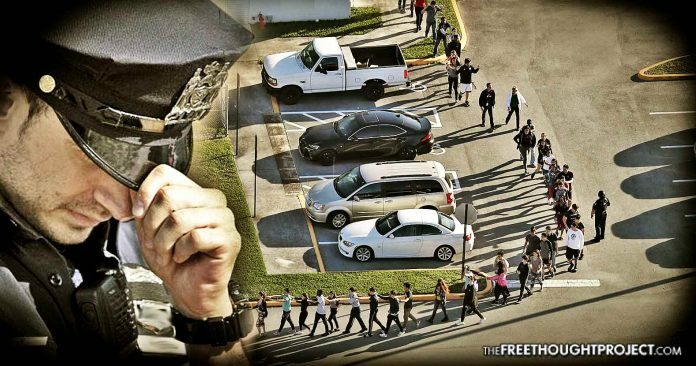 The two departments who responded to the Parkland shooting are now blaming each other for their shortfalls as four cops were seen cowering in fear instead of saving lives. Broward County Sheriff’s Deputy Scot Peterson resigned this week after a video showed him cowering in fear while there was a shooting at Marjory Stoneman Douglas High School. Now it has been revealed that there were three other officers who were taking cover instead of trying to help. All of the officers who hid were apparently from the Broward County Sheriff’s office and were the first to arrive on the scene. They apparently waited for reinforcements before doing anything, but according to officers with Coral Springs Police Department, the Broward County officers remained outside and did not immediately follow them to apprehend the suspect. According to CNN, during a vigil after the tragedy, Coral Springs City Manager Mike Goodrum confronted Broward County Sheriff Scott Israel over the actions of his deputies, saying that it could have cost some of those children their lives. This issue has caused a bit of drama between the two police departments who are now both bitterly criticizing one another’s response to the shooting. The two departments have since engaged in a childish finger pointing ritual. Meanwhile, Sheriff Israel hit back saying that Coral Spring Police showed up late and entered the school after the shooter had already escaped. “We know it was approximately four minutes after the shooter departed the school when the first Coral Springs police officers arrived. We’re investigating every aspect of this,” Israel told the Miami Herald. The poor response from many of the officers involved has sparked outrage across the country. In light of this recent scandal, it is important to remember the precedent that was set in the 1981 Warren v. District of Columbia court case. In this case, it was revealed that the police actually have no duty to protect individuals, they just have some vague duty to uphold the law, which allows them to avoid any type of responsibility in situations like this. In a 4-3 decision, the District of Columbia Court of Appeals affirmed the trial courts’ dismissal of the complaints against the District of Columbia and individual members of the Metropolitan Police Department based on the public duty doctrine ruling that “[t]he duty to provide public services is owed to the public at large, and, absent a special relationship between the police and an individual, no specific legal duty exists”. The Court thus adopted the trial court’s determination that no special relationship existed between the police and appellants, and therefore no specific legal duty existed between the police and the appellants. While the propaganda of our society portrays agents of the state as heroes, they are nothing more than average men and women, going to work to collect a paycheck, while cutting as many corners as possible in the process, like most of the rest of the world is. Only in their job, cutting corners is a matter of life and death.